The last of the Kopah orders have been sent out, the Christmas gifts have been mailed and PeeWee and I are off to the airport! 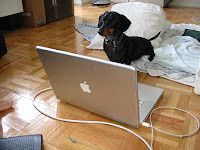 I will try to blog when I am home, if I can pry the laptop away from my stepdad! I hope to do a lot of relaxing, baking, crafting, and watching of HGTV! Have a happy holiday everyone! The last of the presents were mailed out today, what a relief! I leave for my vacation tomorrow. I am so looking forward to the break...just keep your fingers crossed for good weather so I can get off this island on time!!! So with just 6 days left until the big day I am including an easy recipe for Christmas brunch. With everyone's last minute preparations for the holiday I am sure the last thing anyone is thinking of is what they are going to make for Christmas breakfast! This is super easy and a huge hit with my family...I get requests for it every year! Mix soup, sour cream and onion in medium sized bowl. Let chill for a few minutes. When sausage is cool, mix with sour cream mixture. Let sit for a few minutes. Pour and spread mixture over hashbrowns. Cut butter into cubes and place on top of casserole. Add cheese and bake for another 15 minutes or until cheese is completely melted. It's not the healthiest dish in the world but it tastes sooo good! Enjoy! One week left!!! Is everyone ready?!? I think I am, I am getting the last of my gifts mailed out. I am really looking forward to getting on the plane Thursday and starting my vacation!! We all know that Christmas is the season for giving so that is what this post is about. I have listed some great charities below. With as little as a $35 donation you can support 200 children! That is amazing! The new year is all about cleaning and organizing so start by cleaning out your closet. Donate old glasses (neweyesfortheneedy.org), shoes (shareyoursoles.org), even your old wedding gown (makingmemories.org). Donate frequent flier miles to injured soldier's families at heromiles.org, an organization that gives family members of wounded servicemen and women free plane tickets to visit their loved ones recovering at military hospitals across the country. Kiva.org is a great organization that allows you to lend money to a specific entrepreneur in the developing world. Think about it, you can help a woman in Cambodia support her family by lending her money to buy supplies for her crafting. So Mike gave me a bit of grief today because I have been slacking on my "Countdown to Christmas." 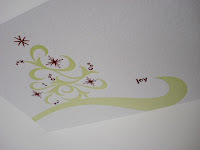 I have just gotten bogged down with all kinds of other Christmas projects and have sort of let this slide! I promise to do better next year!! Anyway, here is a helpful bit about how to ship cookies. I always worry about how my baked goods actually arive when I ship them to people who are probably too nice to tell me that they arrived in a crumbled mess and completely inedible!! So here are some great tips on how to properly ship those holiday cookies you slaved away at for hours! 1. Stack cookies and roll in bubble wrap to form a log. 2. Pack into a small tight box with more bubble wrap, then place inside a slightly larger box. This will help prevent crushing. 3. Wait for the last pickup of the day and send frosted or meltable cookies by air, planes are cooler than trucks. Now rest assured that all that hard work you put into your cookies will pay off when your recipient receives their delicious baked goods fully in tact!! Mike and I had our Christmas this morning. It's too much of a hassle to drag presents to Florida and back so we usually celebrate our Christmas before we head home. It was such a great day. Every Sunday until Christmas they are running old Subway cars on the V line. The subway cars are from the 1930's. It was so neat to see the old cars, a big change from what they are now! We came home and cooked a big dinner and watched Home Alone. We wanted to watch a Christmas movie and I hadn't seen that one in such a long time! It's cold and windy and rainy outside so now we are all bundled up in our apartment reading and working on the computer. The perfect end to a perfect day. Good night everyone, stay warm! In a double broiler melt the white chocolate. Crush the candy canes in a plastic bag (I usually just use the back of a spoon for this). Just be careful, this can make a mess as it usually puts holes in the bag so either double bag the canes or work on top of the wax paper. Pour the candy canes into the melted white chocolate. Then pour the mixture onto your wax paper and spread evenly. Put the wax paper in the fridge for approx. 45 minutes to harden. Once the mixture is hardened remove it from the fridge and break into pieces. It's ready to go! You can package it in cellophane bags or cute containers or tins. I took paper mache boxes and covered them with some really adorable Christmas paper I found at Kate's Paperie. The countdown is back, courtesy of Mike who found me some great info on the history of Christmas trees. I attempted to do this research myself but became quite overwhelmed with the abundance of info I found on Wikipedia. The German religious reformer Martin Luther is often credited with starting the Christmas tree tradition but the first appearance of a Christmas tree was actually recorded in Germany many years after Luther's death. By the 19th century the Christmas tree custom had spread across most of Germany and beyond. Several royal Germans are credited with helping extend the tree decorating custom beyond Germany. However, it was actually German immigrants who brought the tradition to America. Here's an extremely cheesy and posed photo of Mike and I last year in front of the Christmas tree in Bryant Park. My hair was so long then!! Well tonight I make attempt #2 at getting fabric at Purl. Hopefully they won't be having another radiator disaster because I have to get these Christmas presents finished! Wish me luck! I currently have a love hate relationship with my computer...I have been glued to the screen all morning reading through the new blog I disovered, Make It. I want so badly to stop reading but I can't!! So now I have a headache and some serious eye strain. I received a very nice e-mail yesterday from a fellow soap maker who had discovered my blog and gave me props for making soap in a 300 square foot apartment! I thought I would share with everyone this pic of just how small my kitchen really is. I don't even think you could really call this a kitchen as it is simply a corner of my living space where they hung some cabinets and appliances but for all intensive purposes, we will call it a kitchen! *Note the VERY limited counterspace! Oh, BTW...for those of you who are wondering I have not abandoned my countdown to Christmas, I have just had some serious creative block when it comes to posting ideas so if anyone has ideas I would love to hear them and/or stay tuned for this weekend when I will be blogging about Christmas baking! 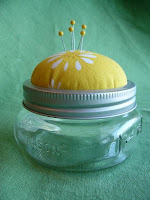 Check out this pincushion I ordered from Thecherrystem. I just got it in the mail yesterday, I love it!! I am thinking of getting one for my mom for Christmas. I received a supply shipment on Friday filled with tons of new fragrances I am dying to try. Of course this will all have to wait until the new year because I am too busy to get into new stuff right now so they are all stored away in my supply cabinet...*sigh* Some scents to look forward to include: Kumquat, Champagne, and Black Tea. Well I am leaving work now to head over to Purl Soho to pick up some fabric for some Christmas gifts I still need to finish...er...start! Oh, BTW I almost forgot to mention this AWESOME blog I found yesterday...it's called Make It and it is geared towards craft entrepreneurship. 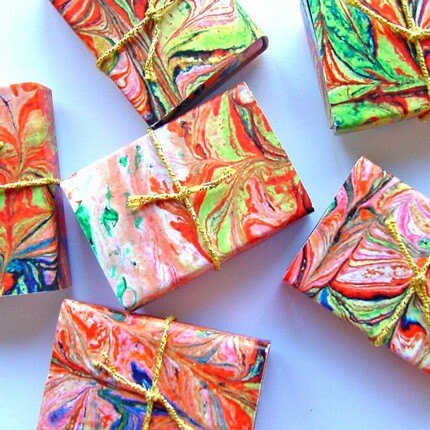 Right now she is documenting the first 100 days of launching her handmade gift wrap business. I'm addicted! I have been reading through her archives all day today (while trying to look busy at work!!). In continuation with my tree trimming theme from yesterday I have to share with you these AWESOME ornaments by Meganaumanhome. These are a must have for the tree! I stumbled across these in a blog a few weeks ago and then again at Bust Craftacular. I just love them! I am so happy with the way they turned out! I had to throw this picture in. My dog is a true lap/couch dog and NEVER lays on the floor, ever! It's been so cold in our apartment recently that he has started laying on the floor next to the radiator because it is always really warm there! So cute!!! Thank you everyone who participated in my blog contest. I loved hearing everyone's family traditions!! Rio Oso Designs will win a Sample Soap Gift Set. Congratulations Rio Oso Designs! I went to the Bust Craftacular today! It was awesome, there was tons of great stuff there. Here's a pic...notice Mike in the right hand corner of the picture checking out a table! Good news, I finally finished my wholesale order!! Mike and I mailed it out this morning before we went to Craftacular. I am so relieved to have that finished! I now have a little more room in my apartment, 116 soaps take up a lot of space in a 300 square foot apartment! Well the holiday party was a hit. I left early to work on my wholesale order but by the looks of everyone in the office this morning, it's a good thing I did! Animal crackers were imported from England in the 1800s. Barnum's boxes were designed with a string handle so that they could be hung on a Christmas tree. Well that's all for today. I'm going to Bust Craftacular tomorrow. I can't wait!! I hope to meet some Etsy folks and finish up some of my Christmas shopping! Tonight is our office holiday party. Unfortunately, I'm not sure how much of it I will get to enjoy since I have to complete a wholesale order! Did I also mention that it's oh 25 degrees outside and I wore a skirt to work today! I had to look festive for the party after all...pain for the sake of beauty! So in honor of holiday "cheer" here are a few cocktails to lighten up even the dullest of holiday parties this year! Mix ingredients with ice in a shaker and strain into a chilled martini glass. For an extra special presentation, rim the glass with crushed candy canes! In a mug stir together ingredients. Top wtih lightly whipped heavy cream. Gently mix ingredients together and serve. I’m to share seven random/weird facts about myself, post the rules, and then tag seven other people. 1. I was raised in Kodiak, Alaska...a tiny island with a population of 6,000 people. 2. I have a serious magazine addiction, I subscribe to more than 16 magazines a month and when I go to a news stand, I still find things to read! 4. I used to hate mustard, now I love it. 6. When I was 9, I broke the growth plate in my finger and had to have a cast up to my elbow. The doctor had never set a finger before and wanted to medivac me to Anchorage (the closest big city by plane to Kodiak). Instead of medivacing me, another doctor walked him through the procedure over the phone! 7. I have been in 7 car accidents, only one was my fault! 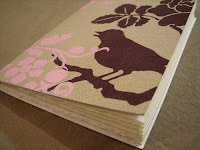 I'm a paper fanatic and love absolutely everything in Earmark's store, especially these fabulous journals. They are pocket size and would make great stocking stuffers. I just love this zipper pouch by Sanfranciscocrafts. 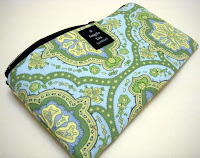 This would make a great gift for girls of all ages and there are several other fabric options available in the shop. This leather journal from Artisangraham is absolutely gorgeous and would make a perfect gift for the artist or writer in your life. The entire book is made by hand out of real genuine latigo leather. I bet it smells amazing! Stumped on what to get the man in your life this holiday season? 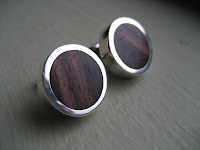 How about these gorgeous cufflinks from Lotusjewelrystudio. They are made of palm wood and silver. They are a perfect combination of classic and modern. There are more than a dozen "little towns of Bethlehem" throughout the United States. However, there is one in particular located in Pennsylvania that has declared itself "Christmas City, U.S.A." Bethlehem, Pennsylvania is an old steel town but beginning the day after Thanskgiving and lasting through New Years Eve, this town transforms itself into a Christmas wonderland complete with strolling carolers, rides in horse drawn carriages and a Christmas marketplace, Christkindlemarkt, that is recognized by Travel and Leisure Magazine as one of the top holiday markets in the world. Perched above the entire town is an 81 foot long star made of steel and lighted so that it can be seen from nearly 30 miles away. I absolutely love this card from Roundrobinpress. 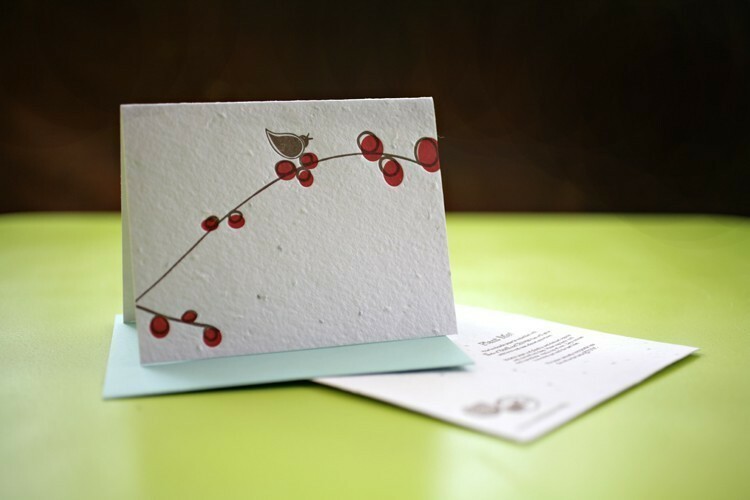 It's a letterpressed card that is made on plantable paper embedded with basil and chive seeds. Not only is it adorable, but it's also great for the environment! 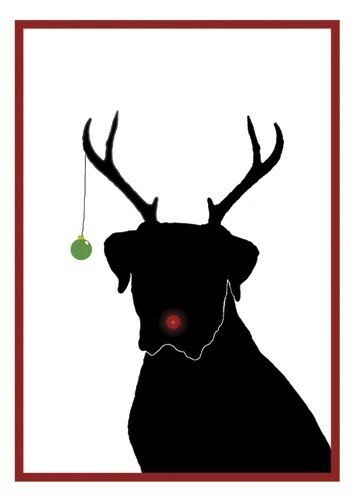 This card from Citrustree is so cute and great for doglovers. There is also a cat card available for those who aren't crazy about dogs! 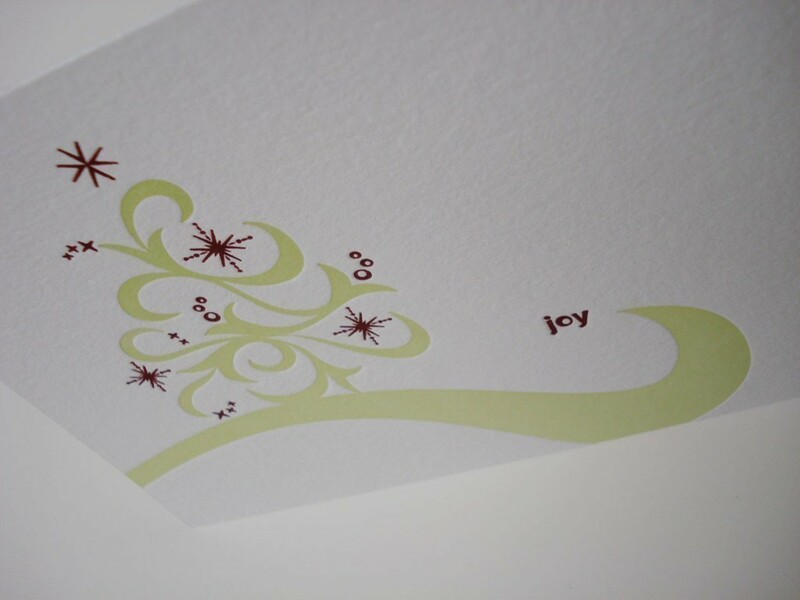 This set of six letterpress cards from BellisStudios are absolutely gorgeous. I just love the look of letterpress cards. According to the site, these are printed on a Vandercook No. 3 press which is known to be the "gold standard" in letterpress printing. Get these before they are gone! Coordinating gift tags are also available. 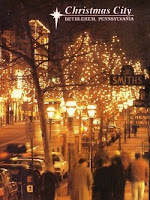 The practice of sending holiday cards began in London in the 1800's. These early cards rarely showed holiday or religious themes. Instead, they were filled with flowers and whimsical designs in an attempt to remind the recipient of the approach of spring. Americans had to import greeting cards from England until 1875 when Louis Prang, a German immigrant, published the first line of U.S. Christmas cards. Over the years holiday cards have evolved a great deal changing with the times and tastes of Americans and there are many variations available today! Vanilla Slush - Mix together a large bunch of snow (make sure it's not yellow! ), sweetened condensed milk, and a dash of vanilla extract and enjoy! This time of year is full of family traditions. My family has a few, like getting to open one present on Christmas Eve and the rest on Christmas morning, or one of my mom and I's new favorite traditions, going shopping the day after Christmas to pick up all of our Christmas supplies and decorations for the following year at half price! So that brings me to my first blog contest in my Countdown to Christmas. What are some of your family holiday traditions? Share them in the comments section of this post by Saturday, December 8th. A winner will be chosen at random and announced on Sunday, December 9th. The winner will receive my Sample Soap Gift Set with the smells of the season: Spiced Pear, Balsam Pine, Peppermint, Vanilla, and Orange Spice. 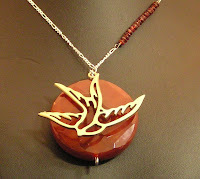 A great item to keep for yourself or give as a gift! Welcome to my first annual countdown to Christmas! Every day from December 1st - December 24th I will be posting about the Christmas holiday. 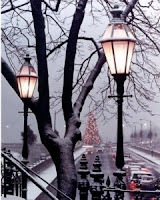 Look for Christmas recipes, pictures, indie gift ideas, contests, and much more! 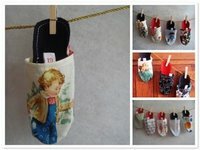 This Advent calendar by greatcraftdisaster is made of fabric shoes using vintage style fabrics, very cute and unique!! 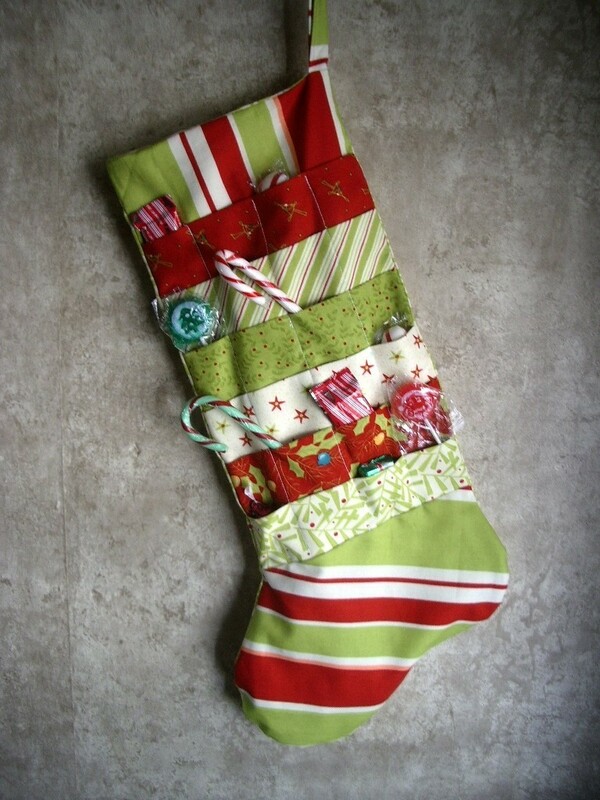 I love this Advent calendar stocking design by ohsosassy. It contains 24 pockets for candy or other little gifts and is a great way to count down the holiday. I love the colorful Christmas fabrics! This Advent calendar by millyandeve features 24 tiny handmade gift boxes. Each box is unique and different!